It finally feels like spring in Richmond–the city went from a clammy winter chill to a dry heat in the span of a week–which means even a simple walk down the block is enough to get you sweating. It would almost be easier to stay inside. 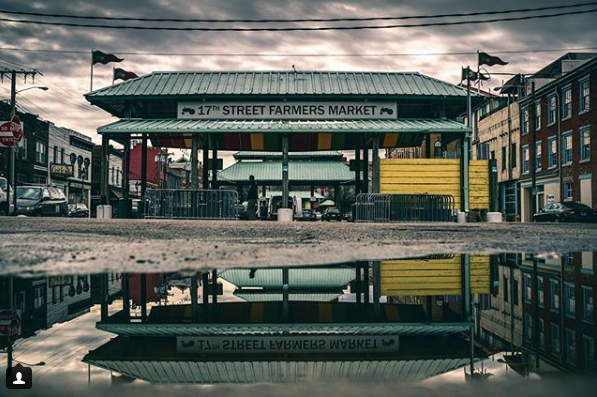 But if you, like us, suffer from a crippling case of FOMO, here are six of RVA Mag’s top picks for this month’s First Fridays artwalk worth dragging yourself through the 90-degree stew of a dozen city blocks. Using tools like long exposure, hand-built cameras, and vintage photographic paper, Chris McCaw brings his second solo exhibition to Candela. The exhibition, featuring work from his Sunburn series and his Tidal series, sets the sun and tide at its center, documenting their movements, and their rise and fall, through a synthesis of traditional photographic staples and new techniques. Joining McCaw is Harrison Walker in his first solo exhibition at Candela. Using varying texture, surface, color, and form, Walker’s abstract photographic works are an investigation of photographic chemistry, perspective, and duplication. The result is a series of repeated circular forms, intended to explore the different ways the viewer perceives them. Photographer Forest Kelley imagines the life of gay men in rural New England through the history of his uncle, Michael, an artist and gay man who died by presumed suicide in 1985. Using video installations, documentary photography, and found film strips, writing, and interviews, Kelley explores the stigmatization of identity and the subjectivity of individual experience. The work largely concerns itself with the unknowable, with visualizing the memories, dreams, speculation, hopes, and fears that plague the LGBTQ community.The exhibit is a haunting examination of a personal history, and how it fits into the larger framework of survival. Though the world may seem far removed from the persecution and isolation of the LGBTQ community that defined the late twentieth century, from the Stonewall Uprising to the AIDS Epidemic, Kelley considers the universality of these events and the discord between culture and subjectivity. The opening reception is from 6 – 8 pm and the artist talk is May 5 at 11 am. You can check out a short story we ran on him here. This First Fridays, all-women coworking space, The Broad, opens its gallery doors to the public from 5-9 pm. The exhibit, Pastimes: Her Present, brings female artists together to examine how a return to pastimes became their livelihoods. It acts a revival of certain art forms, like weaving, quilting, and collage. The exhibit features artists Justine McFarland, Nikki Galapon, Kate Koconis, Barbara Skolaut, and Ynes Bouck. This is a great opportunity to get a look inside the brand new space, newly opened in February, and appreciate the work of five talented local women. Make sure you check this exhibit out before May 31. Tomorrow, The Richmond Performing Arts Alliance welcomes Richmond to a free performance of Cuban music and dance. Participation is encouraged, and there will be Latin and Caribbean dance demonstrations throughout. 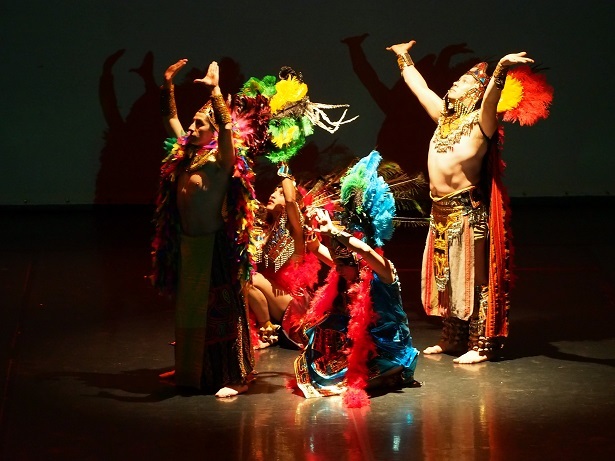 The Latin Ballet of Virginia is a non-profit performing arts organization that seeks to connect communities through Latin cultural dance experiences. Tomorrow night they will preview Alternate Routes: A Night in Havana, a gala and public concert that will take place later in the month. And don’t forget to check out their 17th annual Que Pasa? Festival on Saturday at the Historic Canals of Richmond in partnership with the Virginia Hispanic Chamber of Commerce. There will be over 20 food vendors from different Latin American countries such as Peru, Venezuela, El Salvador, Mexico and more, see the original Xochimilco boat decorations sent by the Mexican Embassy, attend Michel and Liza Zajur’s first children’s book release “The Piñata Story”, try your dance moves to the sounds of salsa and bachata, and much more. Join Chris Smart (the art of cjs) and opensvrgery at 9WG Studios from 5:30 – 9 pm, featuring free raffle prizes from the artist’s as well as Alqmey Apparel and the Richmond Experience. Visual artist Chris Smart is an expert in the art of the dystopian. His photographs pair digital effects with starkly realistic landscapes, from post-apocalyptic visuals interpretations of humanity, to clean shots of the Richmond cityscape. His work is a meld of reality and visual manipulation, generally running 50/50 on effects via camera settings and edits done in photoshop. The exhibit promises a look into the world that surrounds us. Check out our interview with Smart on his most recent work here. This Friday, Gallery5 offers live music–from Gull, Parlor Wall, Serqet, and Basmati–and two gallery exhibitions. The main gallery features Jarred Barr, a 17-year-old artist who has worked in and around Richmond for years. “Wildflowers,” his 5th solo show, focuses primarily on drawing and lettering, alongside one large cardboard sculpture. Barr is largely inspired by the things that often go unnoticed–everyday scenes, song lyrics, and memories. Barr created pieces for the RVA Street Art Festival in 2012. The twist? He was only 11 at the time. The rear gallery exhibit, “Esotericae,” is a showcase of occult-inspired surrealist art featuring The Lady Octavia, Jean-Baptiste, Josephine Rusell, Kelly McLeod, and Lauren and Jacob Borchardt. Now, this is a bit of walk from your usual stroll down West Broad Street for First Fridays, but well worth the drive over to Manchester. Brewer’s Cafe is putting on their monthly event series, Manchester Manifest featuring live musc, DJs, art, an art auction, live painters, food trucks, outdoor bar, vendors and much more. This month, there will be live music from RVA Mag’s contributor Hip Hop Henry, Zhe Aqueen and the Good Vibe Tribe and more. Free. 4-10 PM. For a full rundown of all RVA First Fridays events, check out the First Fridays May map here. In tandem with the Halloween spirit, there are several other worldwide holidays that honor and romanticize the recently departed. One of these holidays that are gaining popularity within the United States is Day of the Dead, or Dia De Los Muertos, a celebration of the lives of lost loved ones that originates from Mexico. 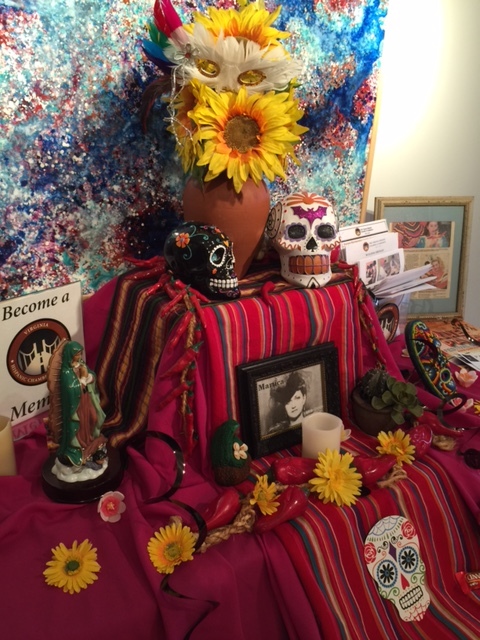 Family members are honored with homemade altars inside the homes of the ones they left behind who decorate these “ofrendas” with pictures, flowers, and favorite foods. The history of Day of the Dead goes back over 3,000 years ago. It is believed that on midnight of October 31, the gates of heaven open for all the spirits of deceased children so that they can return to their families for 24 hours. And then on midnight of November 1, the spirits of adults return to enjoy the festivities their families have planned. The beautiful altars that the families make are full of marigold flowers, pictures, and several hearty foods like fruit, tortillas, celebratory breads called “pan de muerto,” hot cocoa, and water for their weary travels from heaven. Candy, treats, and toys are left for the children while shots of liquor and cigarettes are left for the adults. Preparation for Day of the Dead is expensive and takes some families months to acquire enough financial contributions to present, often taking a whole month’s income, or more. These indigenous people believe that the satisfied spirits of their loved ones will offer the family protection and goodwill for the coming year, while the tactile process of assembling altars brings the families together. And on the final afternoon of the holiday, families take their celebrations to cemeteries where they share stories about their deceased and clean the local tombs. 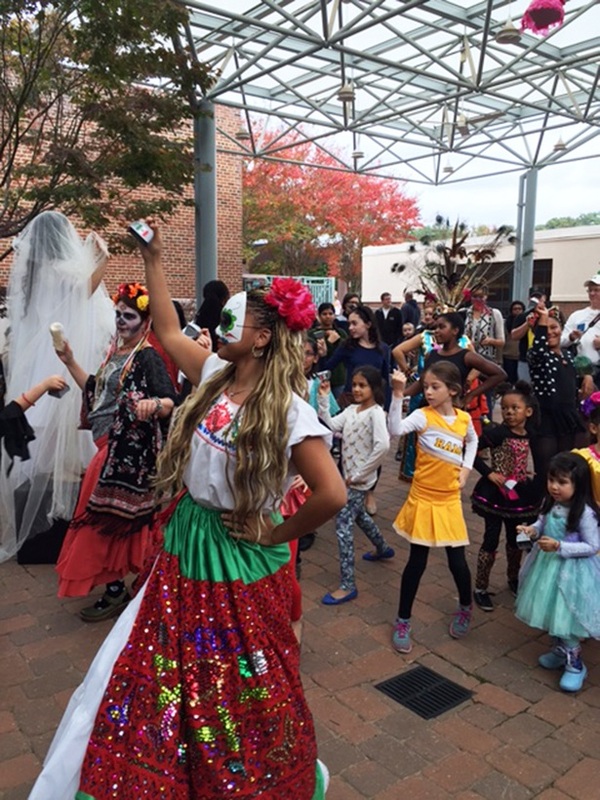 Every year in Richmond, the Latin Ballet of Virginia and the Glen Allen Cultural Arts Center collaborate to facilitate a free-to-attend festival for their celebration of Dia De Los Muertos. Held at the Cultural Arts Center, the Latin Ballet, alongside Richmond Ballet Minds in Motion Ambassadors, produce dance performances to the public that share culture, history, and in-depth looks into the holiday. Last weekend’s festival is its third year taking place at the Cultural Arts Center which included costumes, art activities, crafts made from tissue paper and marigold, live dance performances, Dia De Los Muertos temporary tattoos, and sugar skulls. King is from Colombia where do they not celebrate the holiday. 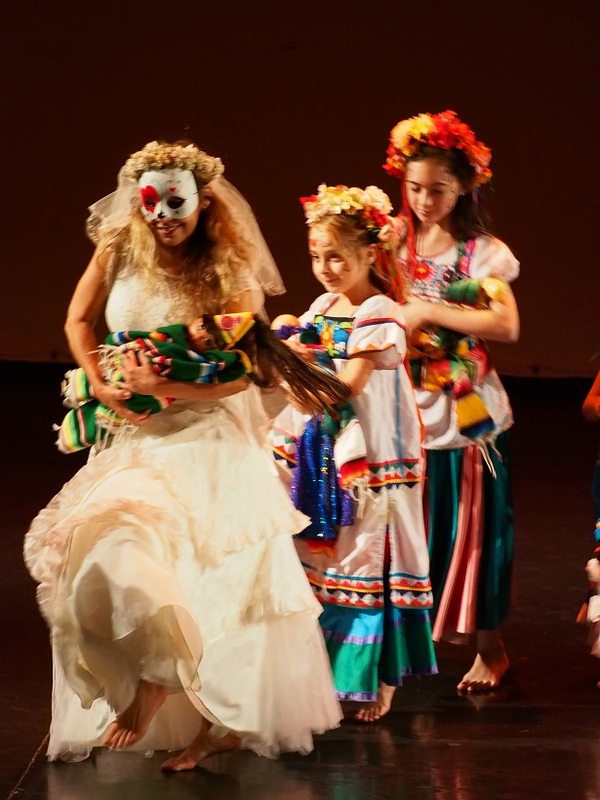 Last week, The Latin Ballet of Virginia and Swift Creek Mill Theatre also put on several performances of Dia de los Muertos in addition to the annual festival. King elaborated on the origins of the Aztec celebration of Day of the Dead, and it began with the observation of the monarch butterfly migration. Monarch butterflies are located all across the United States in natural habitat, but when the winter comes around, the butterflies migrate south to one location. The 2017 Dia De Los Muertos Fiesta held a special place for all dancers of the Latin Ballet. About two weeks ago, dancer Ivana Lo Piccolo passed away to a battle with lung cancer, and King and the Latin Ballet paid tribute to her life by creating an altar to her that was on display throughout the entirety of the festival. “We adorned her altar with pictures in ornate frames, marigold, and a dress of hers that I had kept for some reason.” Because of the holiday’s holistic tradition, she was able to dance with her friends again,” King said. If you missed out on The Latin Ballet’s Dia De Los Muertos celebration, you can celebrate with Richmond’s 12th Annual Halloween Parade presented by ALL THE SAINTS THEATER COMPANY tonight. Dress up in a costume, make your own giant puppets or flags, and head out to the corner of Main and Laurel streets at 7 pm tonight to help celebrate the times and honor the dead. And on Nov. 1, Casa Del Barco will host their annual Day of the Dead celebration with food and drink features as well as an authentic Dia de los Muertos altar. The restaurant and tequila bar will be holding an Instagram contest running all day long for a chance to win a $50 gift card to Casa del Barco.